Why is U.S. Army Special Forces training so much longer than SEAL training? U.S. Army Special Forces (SF) training is “so much longer” because even after a soldier has completed basic combat training/advanced individual training (BCT/AIT) or One Station Unit Training (OSUT), which combines BCT and AIT into one contiguous course vice two separate courses, and Army Airborne School, for a total of approximately 19 weeks of training, a soldier must complete from a minimum of 64 weeks to a maximum 107 weeks (depending upon specialty), of SF training to become SF qualified. This includes Special Forces Preparation and Conditioning (SFPC) and Special Forces Assessment and Selection (SFAS) as well as all phases of the Special Forces Qualification Course (SF “Q” Course). Total training time from beginning BCT or OSUT can be for as long as 126 weeks (over 29 months, again, depending upon specialty) of total training to earn the Special Forces “Long Tab.” The reasons for the very long training time are two-fold: first, all SF soldiers are fluent in at least one language other than English, and second, all SF soldiers are qualified in a specific SF military occupational specialty (MOS) at the “expert-level” in their specialty. Enlisted SF members (a.k.a. Green Berets) qualify as either weapon (18B), engineer (18C), medical (18D), or communications (18E) sergeant, and are all qualified to recruit, organize, train and advise or command, indigenous combat forces up to company size. Soldiers do not need to “wait five years” to apply for entry into SF (no one “enlists” directly into the “Green Berets”). However, enlisted soldiers must be at least a PFC (E-3) or enlist with an “18X Program” contract to be a candidate for the SF Initial Accession (IA) program. These potential SF candidates must still complete OSUT, Army Airborne School, and SFPC before eligibility for SFAS. Entry into SF is by no means guaranteed. 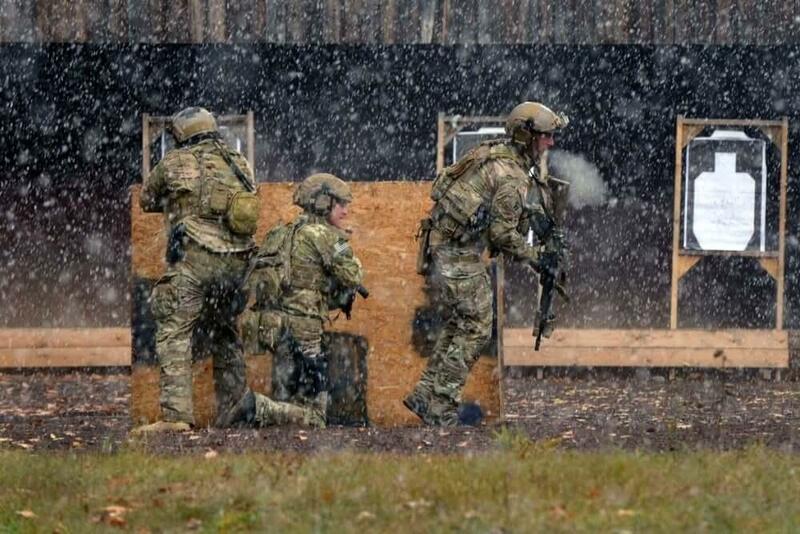 While the missions and training of Army SF and Navy SEALs (as well as Marine Raiders), do have some similarities and overlap, each one (as well as Air Force Special Tactics) provide unique skills and capabilities that complement each other and provide unparalleled special operations capability to the United States. There is the primary mission of U.S. Army Special Forces. They are not “shock” troops, like SEALs. Their primary mission is to interact with foreign allies, training them and when necessary, lead them in combat. Often they do this behind enemy lines, without regular contact and supply from command. So, they have to be EXPERT in their specialty as there won’t be another person to handle it or resupply if something gets broke. And quite often their equipment will be whatever the locals can supply. A U.S. Army Special Forces soldier is among the best-trained soldier that the US produces, bar none! The reason they wanted experienced soldiers is again a reflection of their primary mission. They need more mature people who are aware of what is involved. And have a commitment to the Army. My understanding now is that you can qualify for SF Q school right out of AIT if you pass some additional tests. Why can Sailors enlist in SEALs immediately and Soldiers need to wait five years to enlist in Green Berets?